On September 11, 1944, I arrived as the advanced element of our command with the train at Dallgow, and reported at the major's office, where a Hauptfeldwebel was already leading the newcomers to the barracks of their companies. I received beautiful private quarters at the family Wegener at Dallgow. I already received a message that I was going home for two weeks, like all the others of our Division who came back from the front at Normandy. I was the only officer left from our 2nd Battalion, Grenadier Regiment 982, together with a few men. When I came back after my nice holiday, I lived in the Wegener quarters. They were very kind to me. Mr. Wegener was the county constable of the village and sometimes he went hunting. From time to time they invited me for dinner when he caught a rabbit or a duck. Our new Battalion commander, Hauptmann Schneider and his adjutant, Lieutenant Peters, were very busy with the set-up of our battalion. Several officers of our battalion were new and unknown to me. Every day some more newcomers came; many in Gray/Green Kriegsmarine uniforms, or in Blue/Gray Luftwaffe uniforms. Most of them had only short and insufficient training. That's why the companies were mostly outside in the field and at the training range, to teach the men how to be infantrymen. I was always on the move on a bicycle, having to visit shooting ranges at the training field and having to make suggestions. These were coordinated at the Battalion and passed on as orders to the companies. I was always on the move on my bicycle to check the area for our planned training. On a beautiful sunny day I saw a daylight attack of one thousand enemy bombers at the nearby Siemensstadt at Berlin. Soon the sky got dark with black smoke and the sun couldn't be seen anymore. At the end of this there was a fire training of all the heavy infantry weapons, mortars and infantry guns at the firing range. It was very impressive to see how tremendous such a concentrated use of the guns must be to an attacking enemy. 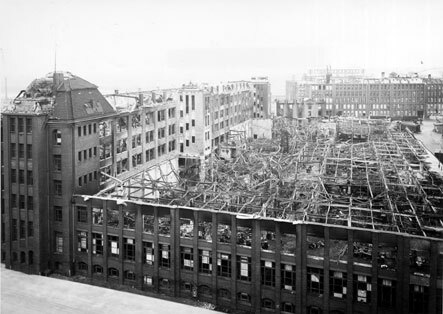 The Blockwerk in Siemensstadt after an air raid, 1944. During the fighting in Eifel we always used it like this and the enemy suffered many losses because of it. In the last weekend there was a twenty-four hour regiment training that reached as far as the Wannsee. I received a horse and was always in the field. It was pretty interesting to train to work together in such a big group. The training of the troops did not have much time left. The moment that we were going up front was coming closer. The troops consisted of about twenty percent skilled infantrymen and the rest were former Kriegsmarine, or Luftwaffe members. Officers and NCOs were mostly from the Infantry and you could easily recognize their experience from their medals. 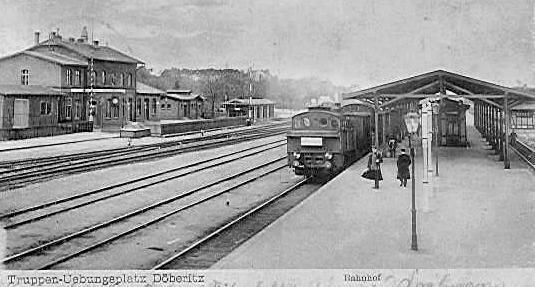 On October 30, 1944 the Battalion got on the train and in the dark we left the railroad station at Dallgow. We rode from Magdeburg and Paderborn in a westerly direction. At Cologne-Mühlheim there was an air-raid warning. The train stopped between houses, no one was allowed to get out of the train. It was a strange feeling when the FLAK started to shoot and some bombs fell in the distance. In the early morning, the train stopped before it entered the Düren railroad station. From time to time heavy enemy artillery fired at the railroad tracks. Every few minutes an enemy "greeting" came rushing in, but it didn't cause that much damage. It took about an hour before we finally got on to Vettweiss. There our train was unloaded under the protection of light Flak. Shortly thereafter enemy planes appeared and they threatened the whole area. Our companies were marching in a long stretched column in the direction of Nideggen, using every cover that we could find. In the distance we could hear the rumbling of the front very clearly. After marching for a while, we recognized the explosion of every single shell. No one knew what was going to come the next day, and the men were in a depressed and quiet mood. Once in a while we meet civilians with all their belongings, some with horse-drawn carts, handcarts and even with baby carriages or bags and backpacks for their most important things only. Their faces expressed what they had to live through, having to leave their home and belongings. The "front-thunder" was coming closer; we could hear the bursting menace of the exploding shells. Our tension grew when the front came closer. I marched with our Commander Hauptmann Schneider at the lead of the battalion. At the crossroads at Brück I stopped a truck to ask for the road to Harscheidt. When the truck drove on, I saw what it had loaded. The legs and boots of about twenty dead soldiers could be seen under the canvas. Some officer’s boots were among them also. We shivered thinking about the reality. After we walked the road uphill, we finally reached Hill 366 at the woods line of Harscheidt. The lead of the column waved for the rest of the men. Rest! The impact of the enemy artillery was very close; they were coming from the direction of Bergstein where the truck had come from. Hauptmann Schneider ordered me to the Regimental command post which was on the edge of the village of Schmidt at the road to Heimbach to return with further orders and a runner. It was already dark. We barely reached the first houses of the village and were standing between some horse carts when the first shells came in and exploded very close. We quickly jumped into the ditch for cover. There was a lot of confusion in the street, horses backed up; we heard screams from the men that were hit. Before we could think about what to do, the next round was falling into the moving column. I decided to go around the village on the left side through the fields, which wasn't difficult because of the clear night. Soon we reached the hunting lodge while Schmidt was still under heavy artillery fire. We quickly got back to where we came from with the orders for the release while shells were coming in only a few hundred yards away at the village of Schmidt. Our battalion moved through Schmidt and into the defenses around Rollesbroich. I talked with the Commander and suggested that only the vehicles and carts should go through Schmidt because of the artillery that was coming in on the village. The men shouldn't go through. We started marching in a long stretched column and went around the village. After crossing two valleys we safely reached the road at Gerstenhof. We rested for a short while and marched along in the direction of Strauch. At the woods line on the right side we were to meet some runners at a pillbox who would lead us to their line of defense, but we couldn't find these men. Finally our Hauptmann ordered us into a firebreak to the right and we kept walking downhill. I had a bad feeling about this. I thought something stinks. That's why I suggested we walk back to the main road. If we had followed this firebreak, we would have walked right into Simonskall. The next day the Americans started their attack from the Kall Valley to Kommerscheidt and Schmidt. After another search along the road to Strauch we finally round the spot where we were to meet the runners. In the meantime our vehicles had crossed the village of Schmidt. They had some wounded. The pillbox 139/40, which was located a few hundred meters inside the forest, was our Battalion command post and the other half of it was a first-aid post. We were glad that we finally found it. A Sergeant of the unit that we were to replace called my name. In September we put up an Alarm Company together at Venlo in Holland. This was just a small experience but it helped to make me familiar with the new circumstances. 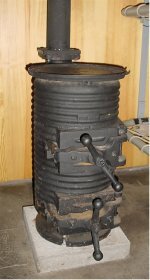 The burning logs in the small stove gave a comfortable heat. Our predecessors informed us about our new tasks. They showed us on the maps where several companies were, the heavy weapons and the communications. Telephone wire was partly dug in and the rest was lying on the open ground. The other half of our double pillbox was used as a first-aid post. Inside was the assistant doctor, Dr. Egel. It was still night when our companies were brought into their new defenses. The old troops were released and they were gone by daylight. Our communications unit was not far away from us at pillbox 142. It was coming and going at our command post. The telephone kept ringing and the runners were coming in from all directions while others were going again. At daybreak we could see the steeple of the Lammersdorf church. The Americans had a observer positioned there and every imprudent movement at our woods line resulted in a few incoming rounds. Today is the 2nd of November. The weather was wet and foggy, temperature around 32 degrees. It was pretty miserable outside. Part of Grenadier Regiment 983 (of the 275th Infantry Division) on our right side were involved in a heavy fight to defend the Forest of Raffelsbrand with the pillboxes 372, 372a, JG2, JG3 and 22. We could easily hear the fighting in that area. During the next days there was a hard and tangled fight for Vossenack. The Americans pushed through the Kall Valley to Kommerscheidt and Schmidt. At first we didn't know what was going on. On the morning of November 2nd, we sent four runners with bicycles by way of Schmidt to our supply unit at Heimbach to lead the carts with supplies and provisions to our new defensive positions. We waited in vain until the next morning for the return of our runners and our supplies. During the next day we were informed by the unit on our left side that the Americans had taken Schmidt and about the hard fighting behind our backs. The supplies still didn't come on the second night. After a few days we were officially informed by the Regiment about what happened behind our backs at Kommerscheidt and Schmidt. They found the bicycles of our runners east of Gerstenhof, but the men couldn't be found. When I look back, I must say that it was unjustifiable of the Regiment not to inform us about the happenings at Kommerscheidt and Schmidt. We should have protected the backside of the road to Gerstenhof at once. If the Americans were a bit faster, they could have pushed through the front to Simmerath without meeting any resistance. The Kall Valley south of Raffelsbrand was under heavy mortar fire day after day. The unit on our right side told us that there were tremendous losses. In the meantime our companies became familiar with the half finished defense positions. Our heavy infantry weapons, mortars, infantry guns as well as our artillery had ranged in their guns in certain areas. When enemy attack took place, our battalion gave messages to the fire command and a little later our shells were on their way to the Americans. We didn't have much rest at night either. Engineers were working at the defenses. Barbed wire and mines were brought at night. A whole battalion of Russian volunteers was digging trenches every night. During daylight, the Americans at the Lammersdorf church steeple could see every little move that we made. Our area looked as follows: 5th Company at the road Schmidt-Simmerath, west edge of Rollesbroich, 6th and 7th Company at the southern height of the Kall Valley Dam till the road Whs. Kallbrück. The 8th company with heavy machine guns and mortars were west of the Tiefenbach Creek. The enemy quickly recognized our working on our defenses. Their nightly artillery fire at our lines was getting stronger and stronger. One day the Russians mutinied and didn't go out front to dig trenches because of the high losses on dead and wounded. These dead were buried in a small cemetery at the woods line south of the road Schmidt/Strauch. 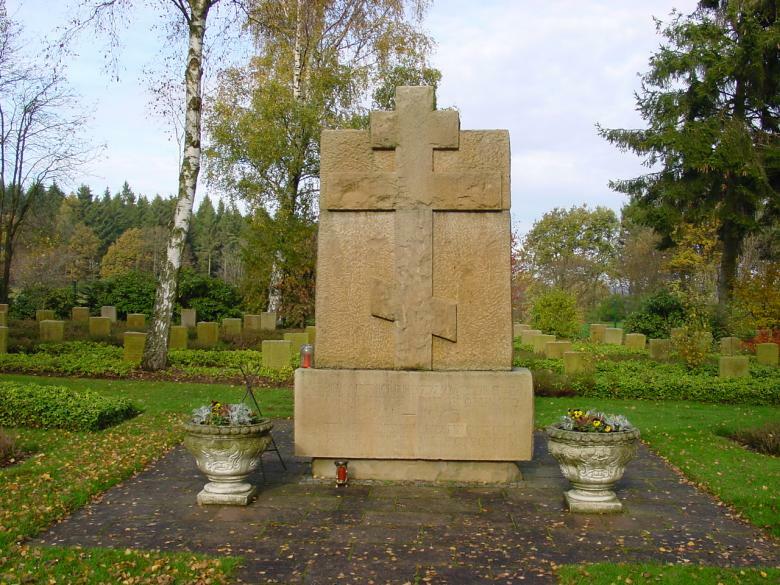 Cemetery for 2322 Russian prisoners of war and forced laborers. 55 of them rest in individual graves, the other ones in mass graves. A small minority is known by name. Within a few days the enemy attacked at the east bank of the Kall Valley Dam. North of Rollesbroich and at the dam itself, the Americans succeeded to take the east bank of the Kall Valley Dam. At late afternoon the enemy forces were pushed back again by our counterattack. We didn't have too many losses. The Americans probably didn't expect a counterattack and they fled back. The next day our battalion Commander Hauptmann Schneider and myself visited the defenses of the 8th Company at the Tiefen Creek Valley, pillbox 510, our front-line at Rollesbroich and the retaken east bank of the Kall Valley Dam. Everywhere we found a lot of equipment that the Americans had left - weatherproof sleeping bags, little tents, cans with rations, little cookers, coffee, tea and cigarettes. They were probably digging in and preparing for the night when our counterattack took place. Our own losses in the first two weeks were about 15%, mostly by artillery fire. Our first aid post in the pillbox beside us was a great help during those days. From there the wounded were transported by Ambulances by way of Schmidt and Heimbach to the field hospital at Mariawald. On the 15th of November our battalion was shifted to the right. The 7th Company stayed in their old defense at the east bank of the Kall Valley Dam and in the area of the dam itself. The 5th Company was to defend the Whs. at Kallbrück (the Pub), pillboxes 111, 112, 113 and 115, and 6th Company was given pillboxes P2, 22, JG3, 372 and 372a. From this area there was no connection to other units until the clearing of pillbox 372 at the end of January 1945. Unit 8910,that was to be released, had tremendous fighting in this area since November 2 and was seriously weakened because of heavy losses. We were just getting used to our new defenses when on November 16 the enemy attacked pillbox 111 and held it for a short period. Oberleutnant von Ruden, who cleared the enemy at the Kall Valley dam was very fast on the spot and was able to retake pillbox 111 without too many losses after a counterattack. Only a few Americans escaped. The rest were taken prisoner. Although we had some snipers in the area, imprudent Americans kept crossing the firebreak in front of pillbox 22 day after day. During clear nights, Hauptmann Schneider and myself often checked the defenses from pillbox 124, via pillbox 111 to 372a. This wasn't possible during daytime because of enemy observation. The pillboxes were connected with trenches. In front of the trenches there were mines and barbed wire. Between all this lay the rest of the completely destroyed fir tree forest. Inside the pillboxes the men could rest after their duty in the trenches outside, but most of all they were safe from the constant incoming shells. It really wasn't an easy task for an attacking force. Our heavy infantry guns, mortars and artillery had zeroed in very well at areas directly in front of our defenses. Most of the pillboxes were connected by telephone with wires buried deeply in the ground. Wires in the open field were only laid in short lengths between the concrete wire connecting pits behind our front. Besides that, we had several field radios with the forward observers. In the next days the Americans attacked pillboxes P2, 22 and JG3. Most of the attacks ended in front of the barbed wire because many of their men were lost in the minefield and because of our soldiers’ defense aided with our heavy weapons. The supply of the 5th and 6th Companies gave tremendous problems. The horse drawn carts with the supplies were coming from Heimbach by way of Schmidt to pillbox 124 alongside the road to Kallbrück. From there we had to carry all the supplies by hand to the front back again inside the old command post, pillbox 125. The release went without any problem. Until the 10th of January it is real quiet at our sector. Only now and then the Americans fired into our positions. We could almost believe that the war had ended. The Ardennes offensive had disrupted the enemy, which gave us a bit of relief. On a clear night I walked with Hauptmann Schneider and two runners to the defensive positions in front of pillboxes 111 to 372. We wished all the men a happy New Year and everyone received a small present - cigarettes, chocolate or alcohol. That night there was hardly any firing. The look of the snow covered forested landscape could almost make you dream. It took us till early morning before we were back at our command post pillbox 125, by way of the firebreak at pillbox P3. The quietness seemed to last too long and we started to worry about it. We could see that the enemy was organizing large scale firing exercises behind their front at Rötgen. Every day we could see an increasing number of vehicles that were taking the road from Lammersdorf to Germeter. There were hundreds of them. Our own artillery fire didn't trouble the enemy that much. During those quiet days we prepared our defenses some more. We checked a second defense line on the right side of the Kall River at Buhlert and with the support of an engineer and alarm company, we started to work. Besides that we were working on a plan to get the two foremost companies at Ochsenkopf (Oxhead) over the Kall River in case of a flood caused by a possible blowing of the Kall Valley Dam. Engineers stretched a cable from pillbox 122 to pillbox 121 and we placed two rubber boats at this spot. The snow stays till the end of January. On January 10th it happens. The enemy attacks the whole sector of our 5th and 6th companies, but the attack is stopped in the minefields after the concentrated fire of all. After about an hour the enemy concentrates the attack at pillbox 22. Our men keep fighting from inside the pillbox for half an hour. Till the very last moment we have the men inside the pillbox on the phone. Suddenly there is a crack in the line and it's over. From there, the enemy moves to pillbox JG3 and starts pressing on it from all sides. In about an hour this pillbox has the same fate as pillbox 22. The enemy stopped its unsuccessful attack under heavy losses around noon at the sector of the 5th Company. During the night our reserve company arrived to try to retake the old positions in the early daylight in an attack from pillbox P2 and 119. Twice these attacks were repelled under severe losses for our troops. In the meantime they pushed in another reserve unit who attacked a third time without the support of heavy weapons. As it was meant as a unexpected attack, it was a costly failure as well. The next day the Americans attacked again and managed to take pillbox P2 pretty quickly. Pillboxes 372 and 372a kept on fighting. On the 12th of January another battalion arrived with about a hundred men. Their winter clothing was not sufficient enough. We placed our battalion command post inside pillbox 119 where I stayed with our commander. At 9 a.m. our heavy weapons started firing. After a successful beginning our attack broke down in the heavy enemy fire. In some places the enemy pushed us back to our line of departure. We had severe losses. Our men were lying in the snow in the open. Without foxholes to hide, they were exposed to the strong enemy mortar fire. Our losses are tremendous. After a short while our command pillbox 119 changed into a first aid post. Severely wounded were carried inside - the wailing and groaning - medics tried to dress the wounds. Severely wounded soldiers were dying. They were carried outside and new ones were brought in. At noon there were about fifteen dead piles up at the hollow road in front of the entrance. Other wounded were trying to help each other while they were going downhill into the Kall Valley. It was late afternoon before the severely wounded could be transported down into the valley. The badly mauled and beaten stayed in their defensive positions. I stayed with a few men inside pillbox 119 until morning. The work on our defensive positions went on night after night. Engineers brought up our weapons. A few days later the enemy unexpectedly started its attack at pillbox 115. They succeeded to blow the pillbox with a special charge, but they didn't destroy it completely. A reserve force is sent up front to retake the pillbox which is now manned by the Americans. The attack is a failure despite the support of our heavy weapons. We lost a lot of men. We received another order from our regiment at noon. Pillbox 115 is to be attacked again the next day and to be retaken. Our Hauptmann Schneider tells the commander of the regiment Oberstleutnant Rösener that another attack on pillbox 115 wouldn't make any sense and is unjustifiable. Our men were lying in their foxholes in the snow between pillboxes 119 and 372 at Ochsenkopf (Oxhead). Our last men were lost at pillbox 115. The rising open ground wouldn't give a chance to be successful in another attack. Hauptmann Schneider asked the Regt. Com. to come over to have a look himself at this area. Finally the Divisional Commander, Gen. König, came on the line and said that it was an order from the Führer Headquarters to retake pillbox 115 and that this order must be obeyed, even if it seemed impossible. Hauptmann Schneider said that he couldn't take the responsibility to waste his men for a useless attack, that we were already too weak for the defense. . It was suggested not to start the attack. They would tell the Führer Headquarters that the new attack had failed. Our Regt. Commander said that he would come up front to see that the attack started as ordered. And that's how it went. He watched how not a single one of ten men came back and how they all got killed. This had a big impact on our Hauptmann Schneider. The enemy tried to take pillbox 510 in front of Rollesbroich for several days. These attacks resulted in great losses for the enemy. Once the Americans asked for a cease fire to get their wounded out and that's indeed what took place. 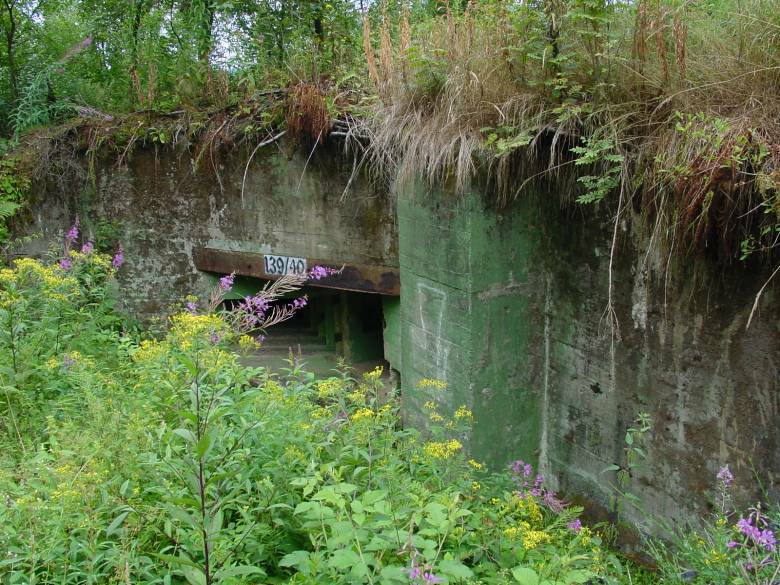 Finally the Americans fired for several days with a big gun directly at pillbox 510. Some men inside were wounded from pieces of concrete that were falling off. Another infantry attack was repelled again. Since the 10th of January 1945 we had very little sleep. There was always something going on. We slept in turns. Mostly I slept between 6 and 9 a.m.
Enemy observation planes could easily make out the paths that we made through the snow between pillboxes and the defensive positions. The result was the enemy mortars fired at the entrances of the pillboxes continuously. Since January the Americans were also shooting with White Phosphorus, but with no great effect because of the snow. Enemy artillery increased from day to day along the whole front. On February 2nd we received orders that on February 3rd we were to clear several of our defensive positions. Our engineers were to blow or to mine the pillboxes. We could get out without any problem or difficulty. 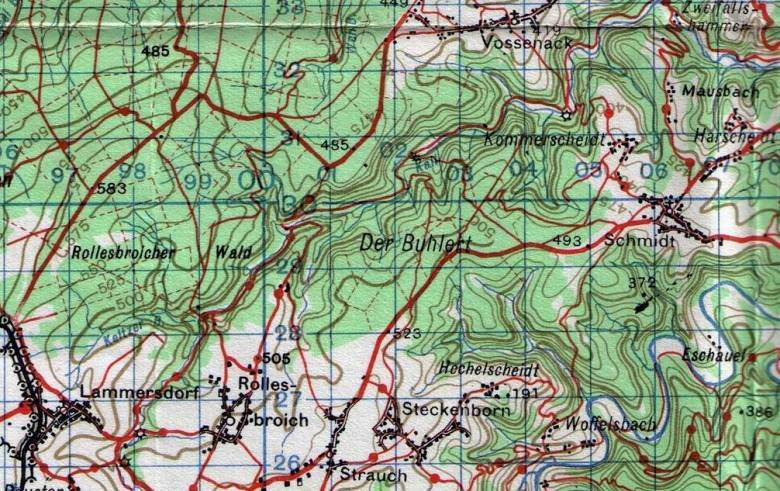 The new sector went from the road Schmidt/Strauch near pillbox 190, along the line of pillboxes to pillbox 128/129 and from there on the right bank of the Tiefenbach to Kall Valley. The men dug in as good as possible. Some rested in the snow lying around. The fighting at Raffelsbrand weakened the companies severely during the last few weeks. After heavy losses the strength of our battalion is about 20 to 25%. The enemy artillery kept firing day and night along the whole front and only increased. Our new battalion command post is now inside pillbox 136. On the night of February 5th at 3 o'clock we received orders to increase the battalion sector for another 800 meters to the left. This order widened the line even more and severely weakened our front. Some company runners were called immediately. A written order had to be made for every company. It was pretty late to accomplish such a difficult change of front lines. It took till the early morning before all companies reached their new sectors. The consequence was that we did not even have enough men in our sector to man all the pillboxes. We repositioned our battalion command post in the early morning to pillbox 220/21 south of the road from Schmidt to Strauch. The first aid post stayed inside pillbox 139/40 and in the main line of defense. We had hardly arrived at our new pillbox when we received the first shocking message. This first message was made by telephone and came from the old RAD Camp (the barracks) where our mortars and infantry guns were positioned. The enemy suddenly appeared there by the hundreds from the direction of Simonskall. There was some short fighting. It didn't take long. No more messages from the RAD Camp (the barracks). A bit later a message from our first aid post told us that the Americans had broken through the defense almost without any sound. We must give up! Now the enemy came from the RAD Camp and attacked along the road to Strauch without much resistance. Finally our communication pillbox 717a near the road was involved in the fight. I didn't take long until the Americans take this pillbox. We could talk to them on the telephone! The enemy took the pillboxes along, and north of the road to Zäunchen at noon. In the afternoon, the enemy pressed against the pillbox that is armed with a 75mm PAK (anti-tank gun) to the north of us. They pushed through the forest to the south and until they could open fire on the backside of the pillbox. This pillbox was manned only by an officer and three men. They ordered me with three rnen to go and reinforce that pillbox. The firing compartment was pointing in the direction of the dragon’s teeth and Steckenborn. With binoculars we can see that a fight was going on in the village, but we couldn't discern friend or foe. The dragons teeth to the road at Zäunchen was still free of the enemy. 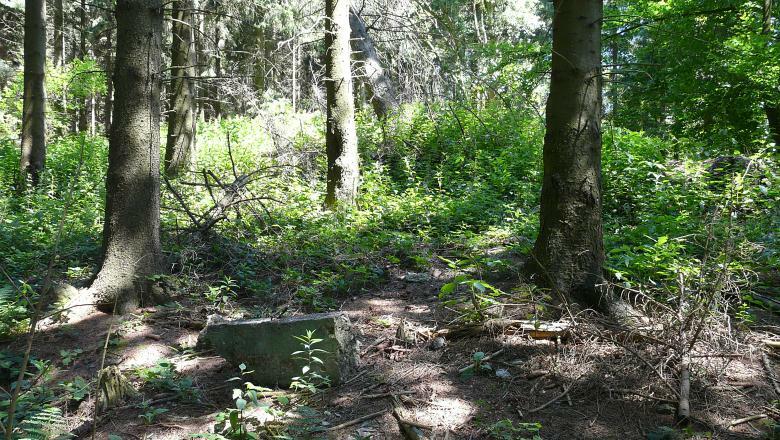 The enemy fired at the backside of the pillbox from a distance of about 120 meters in the forest. From a foxhole at the emergency exit the defenders fired back into the forest. Finally the gunner was killed by a shot in the head. In the meantime they were firing also at the big steel door on the backside. Our way back over the open fields to our command post was cut off. We were trapped. We destroyed the breech of our gun - we couldn't blow the gun because we didn't have any explosives. The hammering of the bullets on the steel back door became unbearable. We crawled out of the firing compartment in the open and became prisoners. Two of our men were wounded by a shot in the arm when this occurred. The rest of our battalion staff gave up their pillboxes at dawn and gathered in front of Gerstenhof. The enemy attacked the next morning with tanks and infantry alongside the road. After a short fight these men surrendered to the enemy. So the next day in a cellar of a house in Rötgen, I met our Commander Hauptmann Schneider, Adjutant Leutnant Peters, as well as Unteroffizier Möbius and Unteroffizier Matzkewitz from pillbox P3 again. Our losses in the last few days were so tremendous that our battalion didn't exist anymore. After this the regiment gathered all men that were left in a small group. The last of this group was destroyed later in the area around Leipzig. That's how the costly fighting our battalion had found a tragic end.